At the beginning of every year, businesses who have their new hiring budget begin to bring in new talent to their company. Many of these new hires will be recent college graduates or other young professionals climbing the career ladder. And Atlanta is no exception. Atlanta has a high population of young professionals, but where are the best neighborhoods for young professionals to live? Below is a list of 4 Atlanta Neighborhoods for Young Professionals to check out. Buckhead – This part of town is one of the most, if not the most, popular district in Atlanta. Buckhead is full of shopping, upscale housing, and entertainment. You will never feel out of the loop living in Buckhead. Virginia-Highlands – Virginia Highlands or VaHi is known as the most popular neighborhood in Atlanta. The neighborhood is made up of four commercial areas surrounded by bungalow homes. You can walk to local shops, restaurants and bars in a small friendly area. The Beltline has also made getting around very easy with pathways and trails. The whole vibe of VaHi is very welcoming and makes you feel like you’re a part of a special community. Little Five Points – If you’re looking for the hippest part of Atlanta, let me introduce you to Little Five Points. This area is known for it’s edgy and alternative atmosphere. With plenty to do, including concert and theater venues, bars, shops, and great food – there’s something for everyone! Stroll around Little 5 one weekend and you may find yourself not wanting to leave. Midtown – When you hear the attractions in Midtown are endless, they are endless! If you live in Midtown, you can walk to almost anywhere that you need to be. Some of the best restaurants in the city reside here. 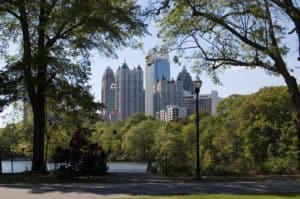 Home to the largest park in Atlanta, Piedmont Park, offers plenty to do in itself. The area is rich with condos, high-rises and houses, so traveling from your residence to your job or favorite attraction is quite easy. If you have a desire to live in one of these areas or neighborhoods, reach out to The Peters Company! We have specialists who work with only buyers, like yourself, who will make the buying process very easy.